BOLTON Wanderers and Queens Park Rangers have emerged as possible destinations for Newcastle United’s great unfulfilled talent Nile Ranger. 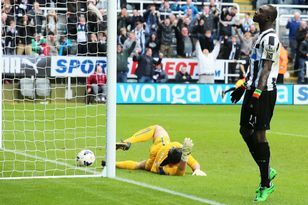 Even after January’s sale of Andy Carroll to Liverpool, Ranger was down the pecking order of strikers at St James’ Park. However, the sooner his departure can be confirmed, the sooner manager Alan Pardew will have funds added to his summer transfer pot. The Magpies are thought to be looking for a fee in the region of £1m for a player who has come through the England youth system, but more importantly it will stop him becoming a long-term drain on their resources. The striker was one of a number of players handed a lengthy contract extension last season – his is not due to expire until 2016. It seemed risky at the time, and the gamble could backfire if it hinders attempts to move him on. Bolton are understood to be looking at Ranger after losing Johan Elmander to Galatasaray and seeing Daniel Sturridge’s six-month loan from Chelsea end. Newly-promoted QPR are expected to hold talks with Jay Bothroyd but, with so much competition, the London club are not confident of reaching a deal. Ranger is one of their fall-back options. Signed from Southampton in 2008 as part of owner Mike Ashley’s policy of hoovering up talent at a young age, the 20-year-old’s ability has never been in doubt – but his attitude off the field has been a constant source of frustration to Magpies manager Pardew. Pardew in particular took to the media on a number of occasions to voice his concerns over the Southampton product, but appears to have accepted defeat by making the player available. Other London clubs, such as Charlton Athletic and Millwall, have also been mentioned as potential suitors for Ranger, who was born in the capital, but both might struggle to match his wages without help from Newcastle. Neither Bolton nor QPR should find that a problem, while ambitious Leeds United showed an interest in Ranger last summer and may do so again. Ranger produced encouraging cameos from the bench last season, getting into threatening positions without breaking his Premier League duck in front of goal. His two goals in Newcastle colours came in a Championship match at Coventry City in December 2009 and last term’s 4-3 League Cup win at Chelsea. Like Newcastle, Bolton are hoping Chelsea decide to send England under-21 international Sturridge on loan once more, and plan to be at the front of the queue for his services if they do. Valencia winger Vicente, linked with a move to Newcastle among others this season, has expressed a wish to move to the Premier League after 11 years at the Mestalla. The 29-year-old said in an interview in his homeland: “In a few days I will decide my future and it will be in England. Blackburn Rovers and Swansea have also been credited with an interest in a player who represented Spain at all levels from under-16 to full international level, where he was capped 38 times, but not since 2005. Defender Steven Taylor, meanwhile, has challenged his team-mates to better last term’s 12th-placed finish in the new campaign. Newcastle looked set to end their first season back in the Premier League in its top half until a last-minute equaliser from Somen Tchoyi denied them three points at home to West Brom. “The players felt disappointed in ourselves and disappointed for the fans that afternoon, because I think they expected us to either get more goals in the second half or at least see the game out,” Taylor, a contender for the vacant captain’s armband, told his club’s official website. “It was not a nice way to end things last season, but overall we did well and we can improve. A SIGNIFICANT chunk of the Andy Carroll windfall has been used to finance Newcastle United’s rising wage bill. NEWCASTLE United will have to spend a huge chunk of their summer transfer budget to bring Charles N’Zogbia back to St James’ Park after Wigan Athletic told them they want £12million for the winger.